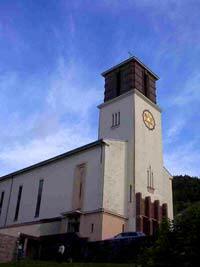 Bergen International Church meets in St. Mark's Church. It is located just outside the city center, next to the main road to Laksevåg, between Danmarks Plass and the Puddefjord Bridge. The address is Lien 45. Most services are held in the parish hall of the Church, (down and to the left from the main entrance) but sometimes we worship upstairs in the main sanctuary. For upto date bus connections, THE LOCAL TRANSPORT allows you to search for the best connection to Lien 45. If you are using the light rail, Danmarks Plass may be a nearer stop, there is also a bus that leads right next to the church or at the Puddefjord bridge. The pastor for BIC is Kristin Lødøen Hope but is currently on leave.